**A version of this story appeared on the IAM Blog on March 27, 2015. Several successful technology companies, including Google, Twitter, Facebook and Alibaba, have acquired patent assets over the past four years from IBM. As the leading recipient of US patents year over year for nearly the last two decades according IBM certainly has the inventory to supply those with cash who want to improve their portfolio quickly. 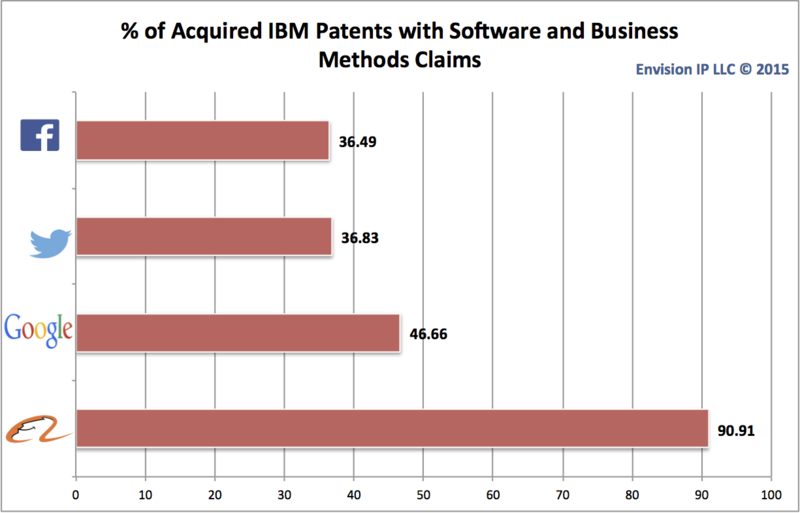 Envision IP reviewed IBM’s patent assignment data since 1991 to get an idea of which companies have acquired IBM patents, and how those patents have subsequently been utilized by the new owners. We found that the vast majority of IBM’s patent assignments have resulted in the transferred patents being held defensively, or being used commercially as in the cases of Hitachi Global Storage Technologies and Lenovo. Envision IP identified only 61 patents from the 15,400 that have been asserted in litigation over the years, a small fraction considering the tremendous rise in patent litigation over the last decade. While we did not have a full list of NPEs and their various subsidiaries, it appears that a very small number of original IBM patents are currently in the hands of NPEs. The question remains as to whether this is a result of IBM’s direct intention to not provide patents to NPEs, or simply happenstance. We began our analysis by looking at recent notable acquisitions by Twitter, Facebook, Alibaba, and Google. Twitter acquired 943 patents from IBM in 2014 for $36 million. Twitter has not asserted any of the acquired patents in litigation, or transferred any of these patents to any third-parties (i.e., has not re-sold any of these patents. The acquisition came on the heels of a reported patent infringement threat by IBM ahead of Twitter’s initial public offering (IPO) in 2013. Of the acquired patents, 440 have claims related to software and business methods. Facebook acquired 696 patents from IBM in 2012 for $83 million. The acquisition resulted by a patent infringement suit filed by Yahoo ahead of Facebook’s IPO. Facebook presumably acquired the IBM patents so that it would have a defensive arsenal of patents to use for counter-suits against Yahoo, and others who brought similar patent threats. Facebook was the target of 22 patent infringement suits in 2011 alone. Of the acquired patents, 254 have claims related to software and business methods. The most recent IBM patent acquisitions announced in relation to an IPO was Alibaba, which purchased 22 patents from IBM in 2013. Unlike Twitter and Facebook, at the time of its IBM patent acquisition, Alibaba already had its own somewhat mature patent portfolio. We reported last May that Alibaba owned 102 US patents and 300 published US patent applications, and that the company’s F-1 revealed over 500 issued patents and ~1700 published applications worldwide. We suspect Alibaba made a strategic purchase from IBM that involved identifying specific patent assets that would be critical to its technology platform, as well as which were broad in the sense of third-party use. Of the acquired patents, 20 have claims related to software and business methods. The cost of this acquisition does not appear public. Google, unlike Twitter, Facebook, and Alibaba, has acquired a significant portfolio of IBM patents well after its IPO. Google currently owns over 2,400 original IBM patents, with the vast majority (2,369) of these patents acquired in 2011. Google acquired these patents at the height of its patent battles with Apple, Microsoft and others that were challenging the Android ecosystem. Interestingly, only four of the acquired patents were asserted in court by Google. The patents were asserted in the same case against BT Americas Inc. In addition, Google transferred 9 of these patents to HTC during HTC’s patent dispute with Apple. Ultimately, we suspect that the acquisition allowed Google to strategically leverage additional patents during settlement and cross-licensing discussions during litigation. Of the acquired patents, 895 have claims related to software and business methods. 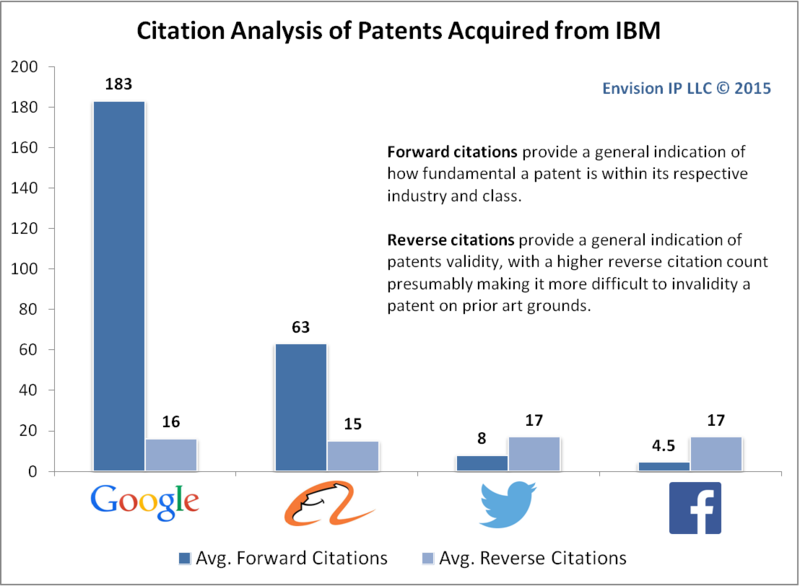 To understand, at a high level, the quality of the IBM patents acquired by these companies, we analyzed the forward and reverse citations. The acquired patents all have relatively the same reverse citation count, indicating they all have the same risk of invalidity on prior art grounds. However, the IBM patents acquired by Google have a staggering 183 forward citation count, indicating that these patents are relatively more fundamental to their respective technology areas. Have such a high forward citation count may also indicate that there is potentially larger pool of third-parties that may be using the patented technology. This is not necessarily surprising, as Google presumably acquired these patents to shore up its patent defenses, and to ultimately be able to enforce these patents if required. On the other end of the spectrum, the patents acquired by Twitter and Facebook have relatively low forward citation counts. It is possible that these acquisitions were done in part to bolster the patent portfolio numbers for these companies in the months leading up to their respective IPOs. Alibaba’s acquisition is a bit of a hybrid, as the IBM patents were presumably acquired in anticipation of the company’s IPO, however, the acquisition appears very selective, with 20 of the 22 patents being business methods and software related, and each having a high average forward citation count. Not surprising, approximately 90% of the patents acquired by Alibaba were related to software and methods, mirroring the company’s primary focus on e-commerce and Internet-based technologies. However, the patents acquired by Twitter, Google, and Facebook contained a much lower percentage of patents having software and business methods related claims. This indicates that these acquisitions may not have been done primarily to protect these companies respective technologies, but rather as defensive acquisitions where apparatus and systems patent claims could be asserted against third-parties. This would be in line with Google’s multiple smartphone-related litigations where physical device, screens, and user input technologies were at the heart of the patent litigations. However, for Facebook and Twitter, having non-software related patents gives these companies a diversified patent portfolio to use for counter suit purposes. Overall, since 1991, IBM has assigned over 15,400 patents to various third-parties. Of these, 3,245 have been subsequently re-assigned (i.e., presumably sold or transferred as part of a merger or acquisition) to other parties. Google is the largest owner of IBM patents, being the recipient of 16% of all assignments since 1991. Other notable owners of IBM patents include Cisco (268), Ebay (281), Microsoft (50), Mitsubishi (44), Samsung (34), Yahoo (27), TomTom (23), and Tivo (6). Please note this data is based only on public patent assignment data, and unrecorded patent transactions have not been included in our analysis. This also includes the 804 patents transferred to Hitachi due to the merger of IBM and Hitachi’s hard disk drive business in 2003, and 2,321 patents assigned to Lenovo during its acquisitions of IBM’s personal computing and server businesses in 2005 and 2014, respectively. Regarding non-practicing entities, a high level search indicates that 5 original IBM patents are owned by Tessera, and 11 are owned by IPG Healthcare. IBM’s patent sales history indicates that it caters to patent buyers in a variety in contexts. Aside for transfers due to IBM’s business mergers or sales, it appears that Google selectively acquired potentially high quality patents from IBM. This is not surprising given Google’s involvement in a myriad of patent-related suits at the time those acquisitions were made. Conversely, IBM was able to offload a large number of patents to the likes of Facebook and Twitter, which do not appear as fundamental as the patents acquired by Google. This also is not surprising, as these acquisitions were likely made to mitigate risk surrounding third-party threats leading into their respective IPOs, as well as to possibly appease investor doubts regarding patent protection.